The great Phoenix Wright finds himself in a difficult position within the Ace Attorney anime adaption’s last story arc. The close friends that once would work together to find the truth are now separated against their will. Farewell, My Turnabout 2nd Trial continues the conflict Maya and Phoenix find themselves in while attending the Hero of Heroes banquet. Juan Corrida, known as the Jamm’n Ninja, was found murdered by stabbing in his dressing room. The main suspect is his stage rival: Matt Engarde the Nickel Samurai. Just after Phoenix learns of the murder he receives information that Maya has been kidnapped by De Killer who has no interest in money. Instead, he is requesting Phoenix to prove Matt’s innocence for the murder of Juan in court or else Maya will be murdered as well. The intensity of this situation comes through the screen well. Phoenix’s voice quivers at the very thought of Maya’s life in danger. He hasn’t spoken with her and doesn’t know if she is completely unharmed. A-1 Studios Ace Attorney animators worked out how to convey the emotional trial of working towards a life and death solution. The face of Phoenix, Pearl and eventually Miles all reflects the real raw emotion of a real person. Miles’ return after disappearing for so long is artistically portrayed in a style owned by Miles. His demeanor in the courtroom demands the attention of all in attendance. At first, his usual hard-core approach to the case seems to hurt Phoenix’s ability to think clearly until he realizes something is off. The prosecutor’s recognition of a danger is portrayed quite well. This emotionally trying situation is played out both in the animation and in the voice recording is great. If this quality continues throughout the rest of the Farewell, My Turnabout arc it would be a befitting ending to this adaptation. The scenes of Maya surviving in a dark basement are a welcome to the often one-sided view points of this adaptation. Her desperation for being reunited with Phoenix comes through well yet she isn’t given enough screen time. Maya’s kidnapping scenario would have been a great time for the studio to slip in a flashback of Maya spending free time with Phoenix or her cousin Pearl. The anime is so driven towards the mystery, clues and suspects it places the character’s own stories in the background. We already are aware of the relationship between Maya and Phoenix yet as an audience we can’t help but crave to know more about these two. Almost every moment the audience sees of the main Ace Attorney cast is always centered around a mystery. There is little to no personal time given which would have made the characters more dynamic. At least the writers have continued the excellent mystery writing skills with each new arc. The subtle clues given and the thought process Phoenix goes through at each trial mimic the games which is a comfort to know that the anime reflects the games’ storyline so well. Disappointment still rules with the lack of creative direction. It seems after so watching so many episodes, it’s clear backstory and “non-work” related moments are kept to a strict minimum. Sadly, the love of the Ace Attorney games is the only reason to stick around till the end of this anime adaption. 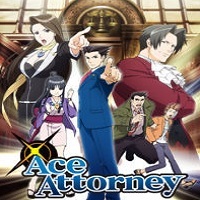 You can watch the Ace Attorney anime at Crunchyroll.